Kick off your visit on the 10th (Mon): see exotic creatures in open habitats at a safari tour, stop by Kristall Galerie, and then take in the waterfront at Swakopmund Jetty. Keep things going the next day: see the interesting displays at Swakopmund Museum, then take a leisurely stroll along Walvis Bay Waterfront, and then head off-road at local off-road trails. To see other places to visit, photos, where to stay, and tourist information, read Swakopmund trip itinerary planner. Amsterdam, The Netherlands to Swakopmund is an approximately 23.5-hour flight. When traveling from Amsterdam in April, plan for much warmer days and somewhat warmer nights in Swakopmund: temperatures range from 30°C by day to 16°C at night. Wrap up your sightseeing on the 12th (Wed) to allow time to travel to Windhoek. 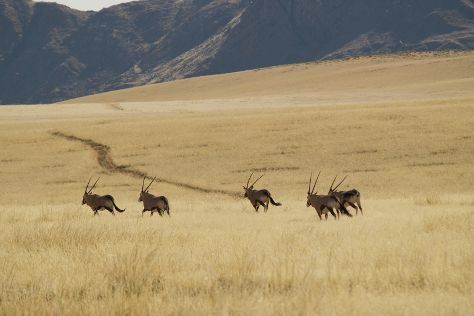 On the 12th (Wed), stroll through Zoo Park, then admire the landmark architecture of Christuskirche, then look for all kinds of wild species at NamibRand Nature Reserve, and finally browse the eclectic array of goods at Namibia Craft Centre. Get ready for a full day of sightseeing on the next day: take in breathtaking views at Fish River Canyon Nationalpark and then see exotic creatures in open habitats at a safari tour. To see other places to visit, traveler tips, and other tourist information, go to the Windhoek vacation trip planner. Traveling by combination of car and flight from Swakopmund to Windhoek takes 2 hours. Alternatively, you can drive; or take a shuttle. Expect a daytime high around 32°C in April, and nighttime lows around 15°C. Wrap up your sightseeing on the 14th (Fri) early enough to travel to Etosha National Park. Kick off your visit on the 14th (Fri): tour the pleasant surroundings at Etosha National Park. To find where to stay, maps, other places to visit, and other tourist information, you can read our Etosha National Park vacation builder. Fly from Windhoek to Etosha National Park in 3.5 hours. Alternatively, you can take a shuttle. 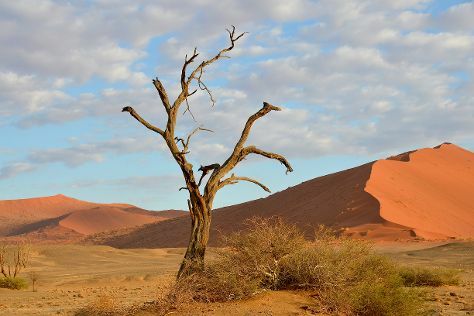 Finish your sightseeing early on the 15th (Sat) to allow enough time to travel to Namib-Naukluft Park. To find reviews, other places to visit, maps, and more tourist information, you can read our Namib-Naukluft Park sightseeing planner. You can do a combination of flight and car from Etosha National Park to Namib-Naukluft Park in 10 hours. Cap off your sightseeing on the 16th (Sun) early enough to travel back home.